Wonderful watercolor illustrations draw the reader into the world of Mei’s 9th century China and all of her dreams about what the west might be like. The story starts with her pestering her father about going with him along the Silk Road to sell their silk. He will not allow it, but does agree to take her smooth, round pebble. The plan is to send the pebble as a gift to someone at the far end of the Silk Road. Each illustration shows a different time of year, in a different spot along the journey. Using the seasons was a wonderful way to illustrate how long the journey was from East to West. 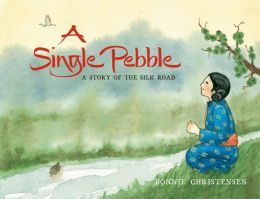 As the pebble was passed from traveler to traveler, the illustrations changed to show the various cultures along the way. Not everyone who carried the pebble was a merchant. There was a monk, a sandalwood trader, a performing family, a thief and finally a pirate! How wonderful to see that it was the child of the pirate who finally was the recipient of the smooth, round pebble. To Mei’s great delight, someone sent a gift back from west to east, also. The smooth, melodic language will become a favorite at read alouds in libraries, classrooms and homes. Second grade readers will love the change to dream along with Mei about a place they have never been. Teachers will love enhancing the core curriculum and literacy skills with mapping, multi-culturalism and history as well as geography of the world with this truly beautifully done story.